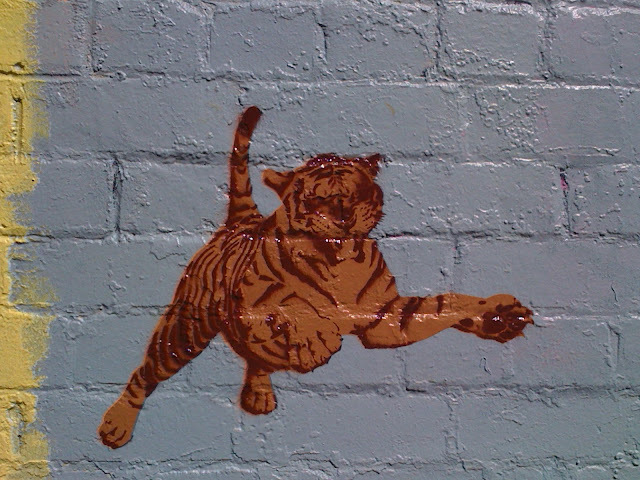 I recently heard about a sweet wall in Sydney from a friend who walked past and 'gushed' over the stencils on it. I wanted to find out more, so I asked about it on the Acid Midget Facebook page. Apparently the wall is in Chippendale and was recently repainted. I went there. It was sunny while I snapped photos, getting a little tan, a little sweaty. This guy Che walked past as I wiped my forehead. So dude, you like stencils? It's a pretty cool wall. Oh, I'm Che by the way. As in 'Che Guevara'. I live here. Che said locals came around regularly to stencil but, because the wall got "a bit messy" with age, he repainted it. If you look closely, bits of the old wall are visible through the new paint. Thinking I should move in next door to Che. We'd have block parties every week with our street art BFFs. We'd walk the streets in blotched skinny jeans covering our bony asses and paint the town rainbow while downing bottles of freedom. Nice red scooter, but I still don't get why people ride them in Sydney. This is a car city. It's an orge of fumes, rage and mute mouths contorting like angry arsholes. In the meantime why not 'vote green'? 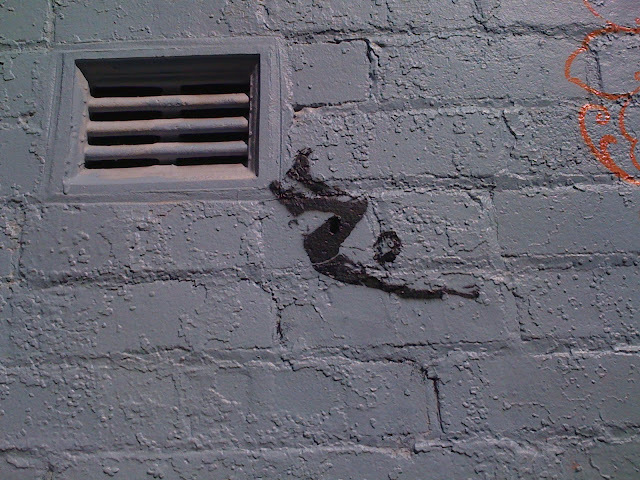 The above stencil appears to comment on the frustrating Federal election Australia just had. 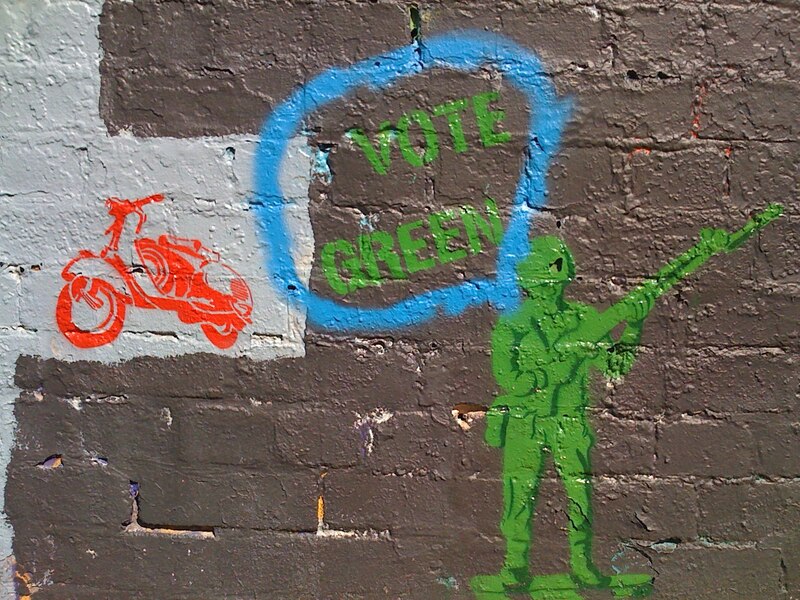 Coincidentally, Aussies did send more votes to the Greens. Now, more bike lanes please Bobby Brown. Soldier: Sir, scaling wall now. Over. Commander: Good work. Have you spotted any yet? S: No sir. I've got night vision goggles on and I can't see them. C: You effing earshole! You can't see because you're using night vision during the day! S: Sorry sir. OK, I've got day vision goggles on now. C: You corksucker! There's no such thing as day vision! Who hired you? C: Ahh forget it. 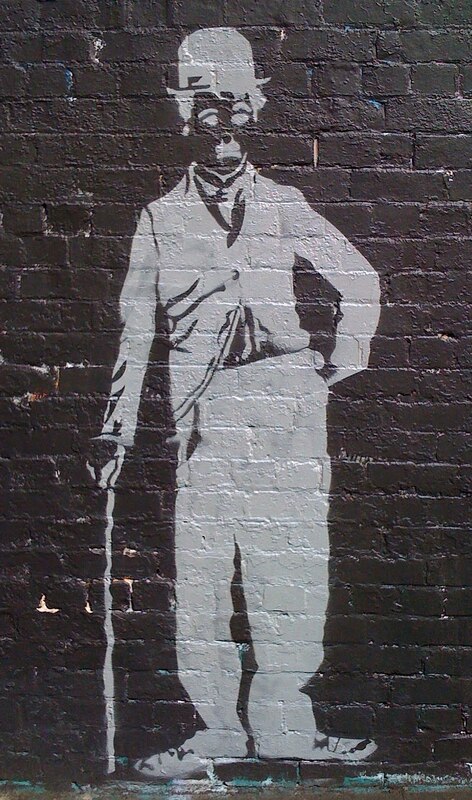 See any of those uckfing street artists? C: Shut up you mutt. Just get down there and complete the mission. 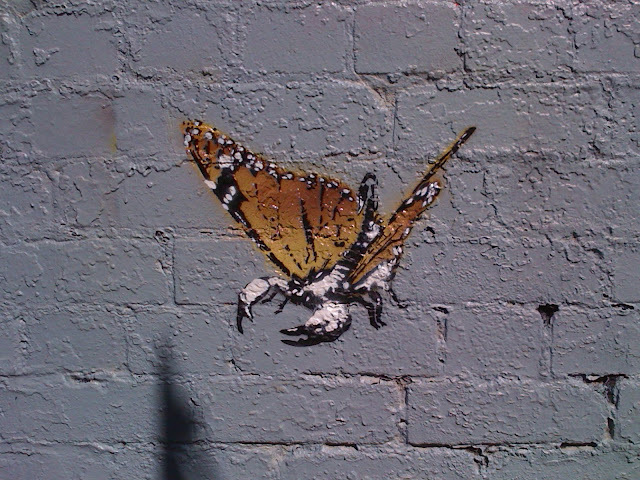 When sitting down to make a stencil that's a cross between a butterfly and a scorpion (Scorpfly? Butscor? Butter-n-scones?) how would you make it? Draw it out by hand? Source the creatures and work from life? Google search/Photoshop/magnetic lasso tool? 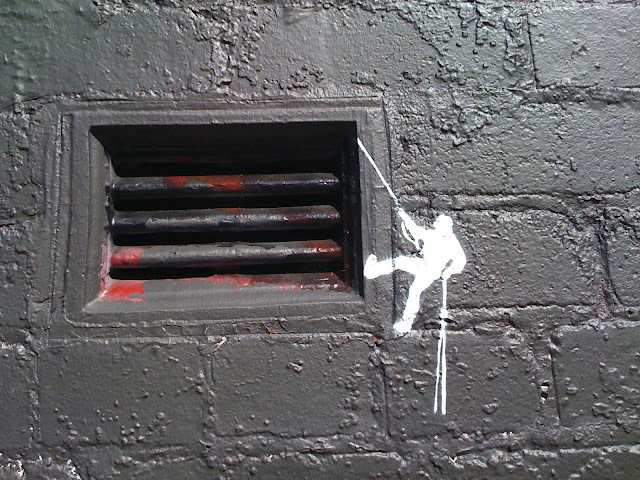 This stencil reminds me of the 911 Falling Man. Sad. Charles Spencer Chaplin was born in London, England in 1989 and died in Vevey, Switzerland in 1977. Street artists use scale to surprise passers-by with either sheer enormity or, in this case, a stencil smaller than a brick. 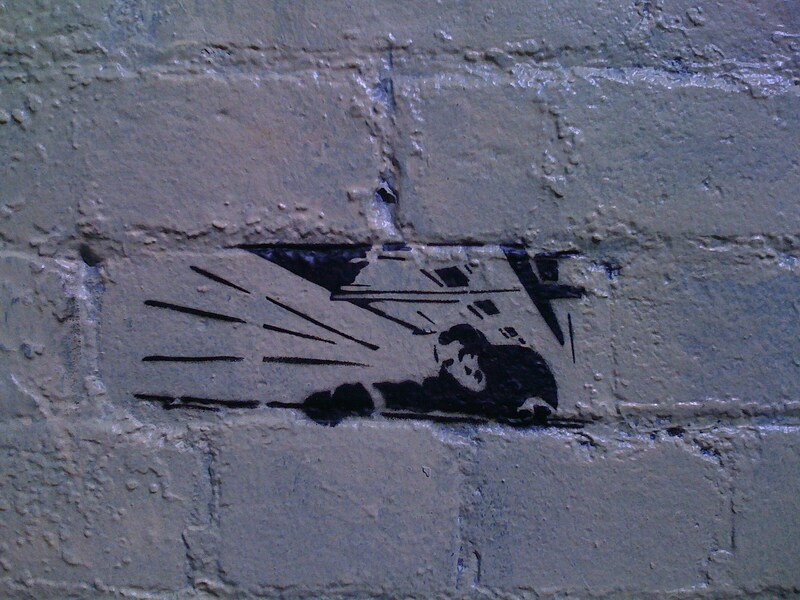 In this stencil Flash Gordon is about to fall from a building in 1930s New York. He clings on for life. A) Land on the pavement and become a stinking pile of meat? B) Be saved by Spiderman/Batman/Wolverine(man)/Mickey Mouse(man)/King Kong/Donkey Kong/Obama/Lady Gaga/All of the above? There's always someone watching you, taking photos, stockpiling information. You could be walking directly into the frame of an Acid Midget photo. You could be a 55-year-old lady with a packet of potato chips, hurrying to calm your munchies with that mmm mmm salty goodness. Great photos. You beat me to it! Hey Lottie. 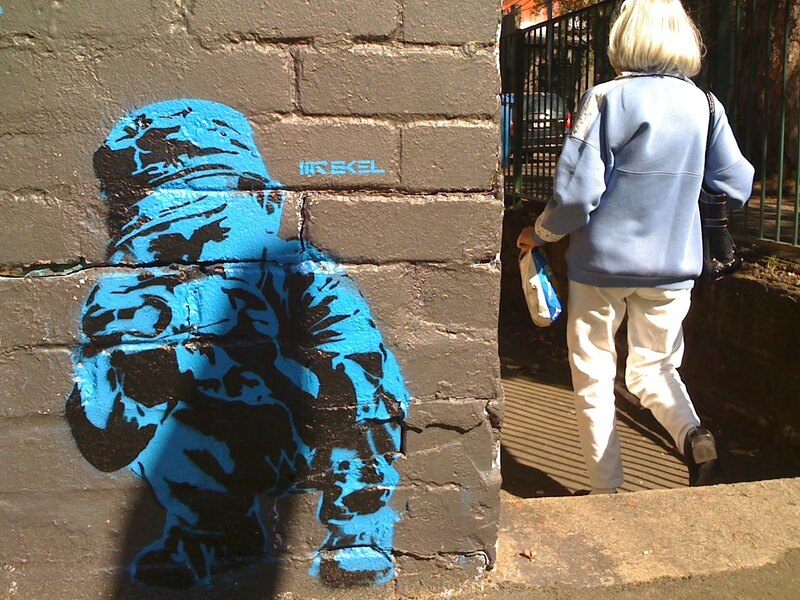 There's probably new stencils there by now! 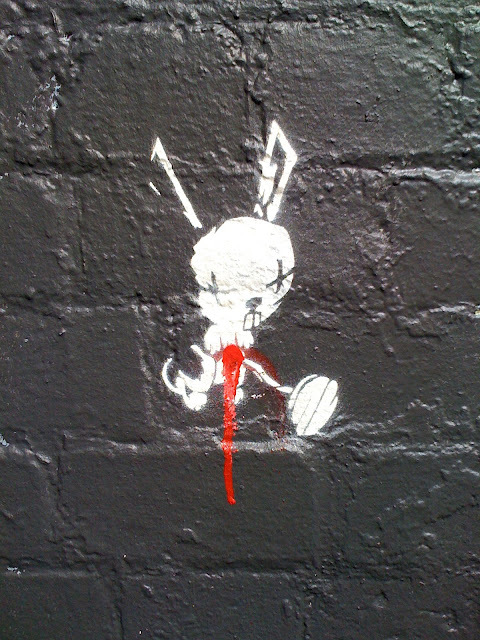 If you have a street art blog send me a link!